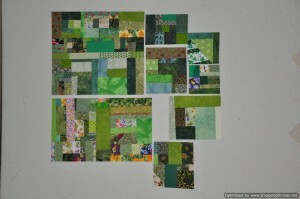 I am on a mission to use up all of the green fabric strips that are on my fabric shelf. The first quilt top that I made was, “Candy Coated” a pattern from Sunday Morning Quilts (by Cheryl Arkison and Amanda Jean Nyberg). 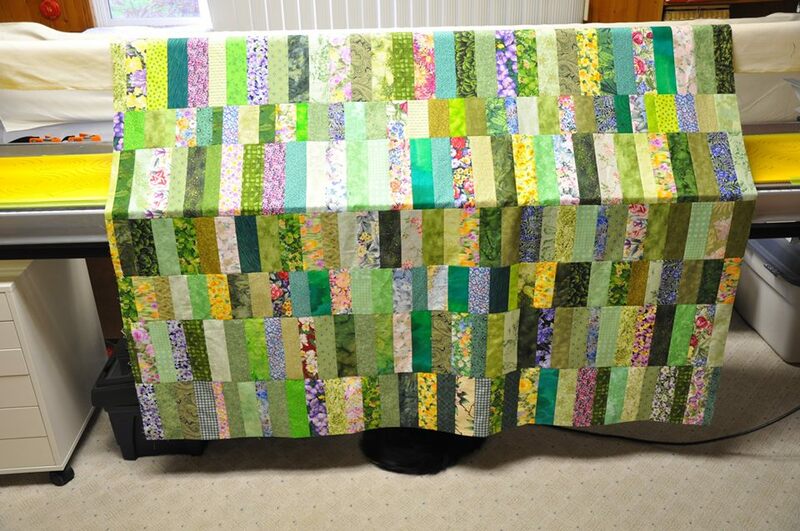 This quilt top met with a mishap when I tried to trim the left side. It ended up being narrower than I would like after my attempt at squaring it up. 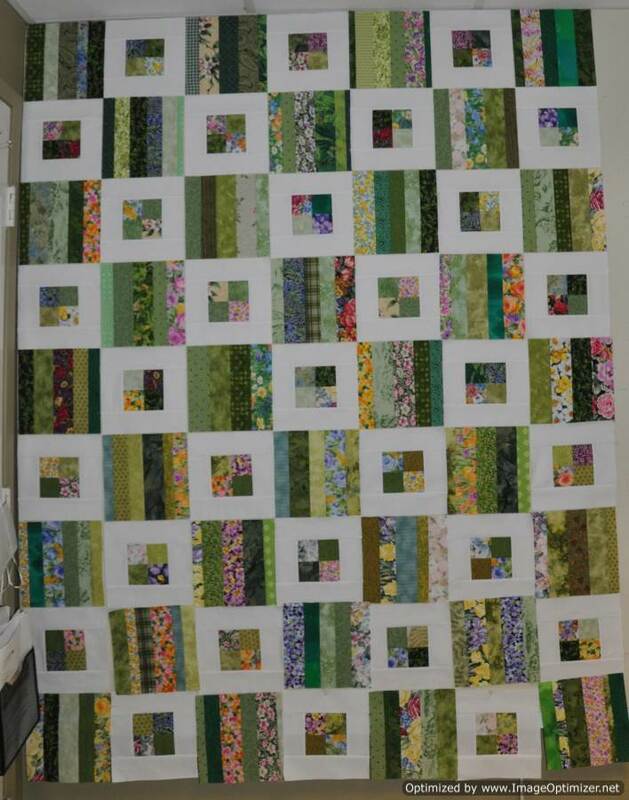 After agonizing over ideas to make the quilt wider again, I have given up and made the quilt shorter instead. 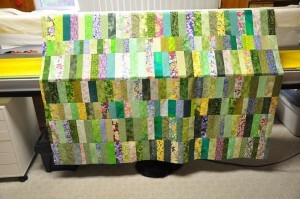 Now it is back in proportion to its width and is still plenty long enough for a lap at 63″ x 75″. 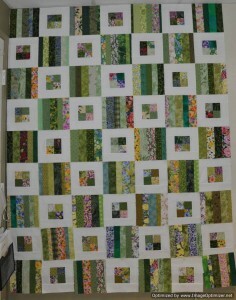 I will finish squaring it up after it is quilted. 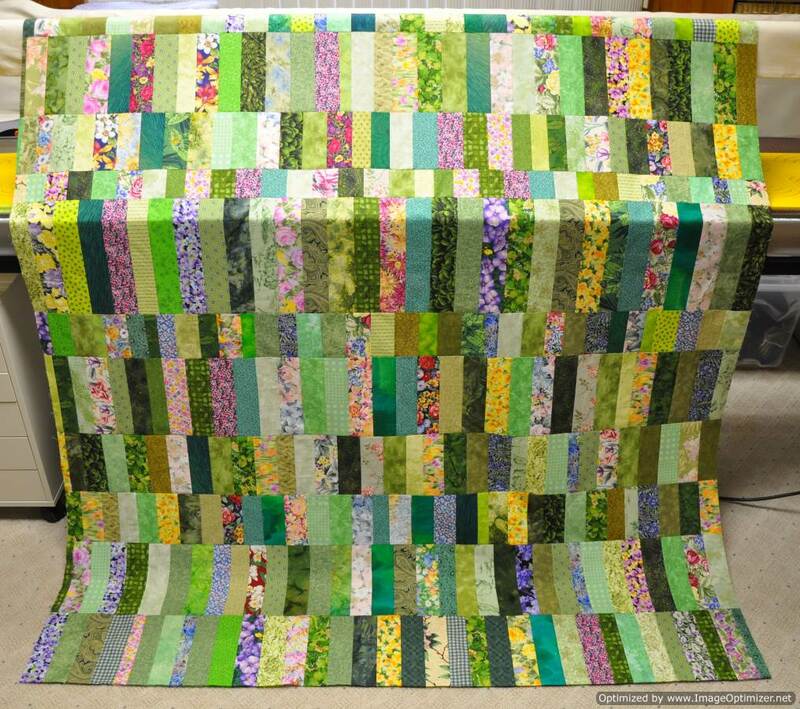 I ended up with many chunks of pieced fabric strips as leftovers after finishing Candy Coated so I came up with a second quilt which alternates the pieced strips from Candy Coated with framed four patches. 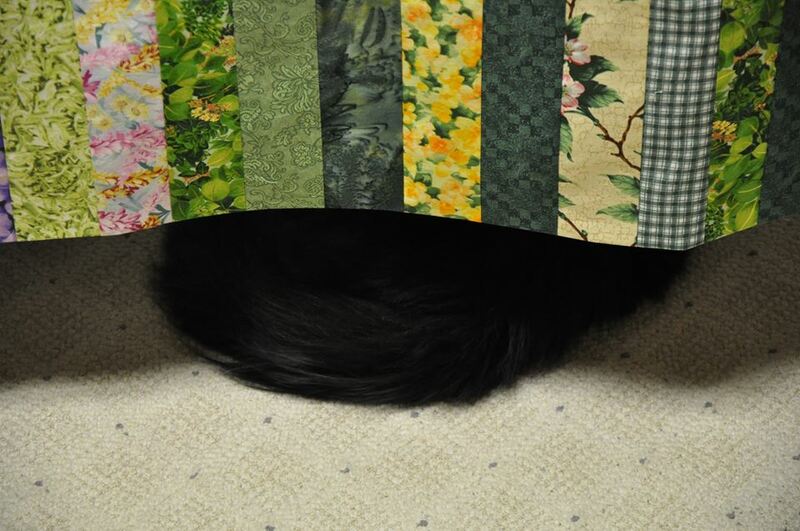 This is a “leftover” quilt. That name doesn’t seem too glamorous, so it has since been renamed “Strings and Cobblestones” by my good friend LindaJ. I like this name better than Leftovers, so Strings and Cobblestones it is. I still have leftovers from Strings and Cobblestones so I am working on making “slabs” from the bits. 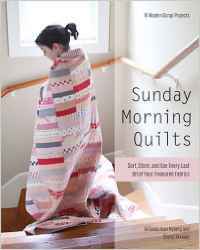 In years gone by, these types of blocks were called Crumb Blocks or Mile a Minute blocks but now in the Sunday Morning Quilts book, the updated name seems to be “slabs”. 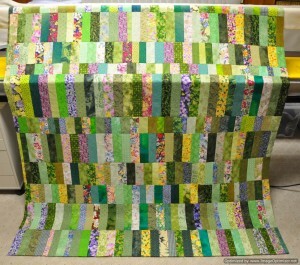 I have made several quilts using this technique over the years and it is the only way i have ever found to ensure that 100% of every last little bit of fabric is used in some way. After putting together slabs, there are no leftovers! 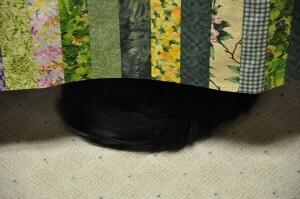 Shhhhhhhh…….someone thinks he is hiding. 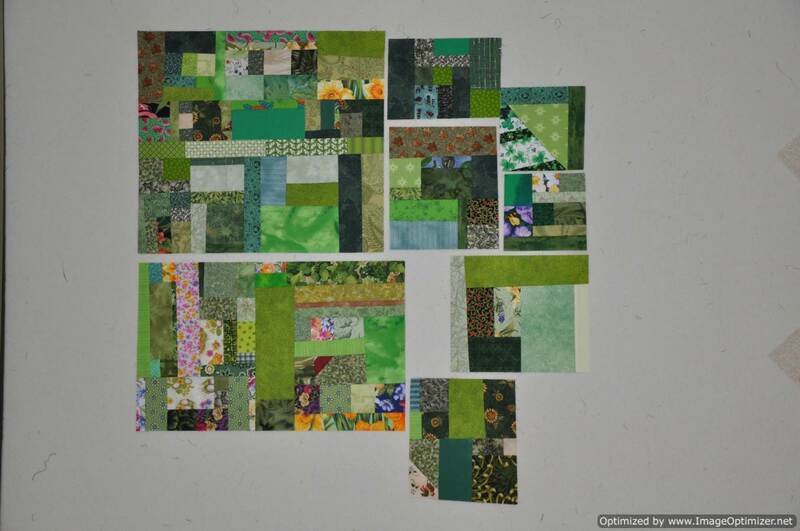 This entry was posted in flimsy, scrap, slab blocks, strips by Norma Hanson. Bookmark the permalink.